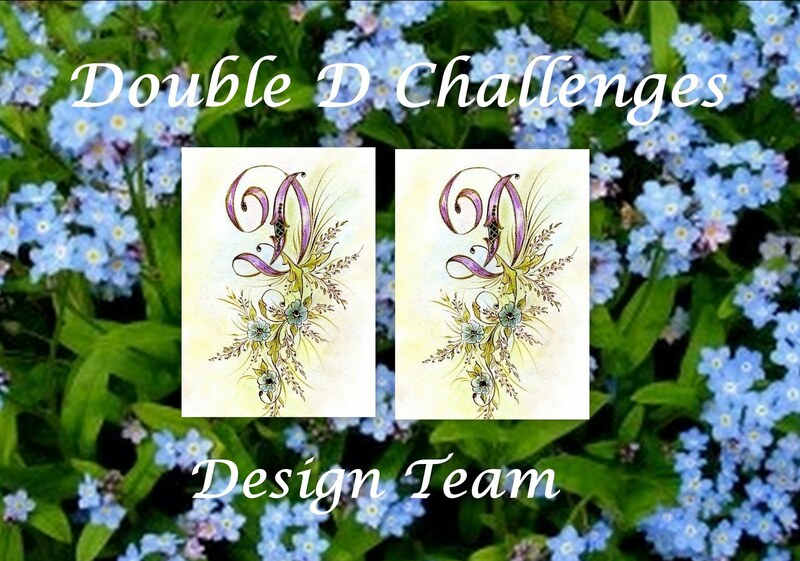 Today I am posting to a new challenge. It is Clean and Simple Sunday. The challenge is #13 Kraft and Twine. 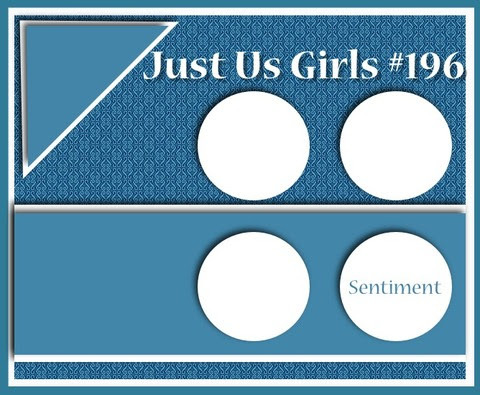 I created this card using GDK stamp set Enjoy the Journey. It fits perfectly with the plaque that I have had forever and wanted to use. 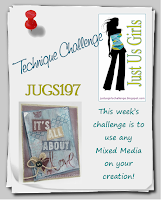 I'm posting this card for the JUGS CHALLENGE #198. It is a color challenge and I started out by collecting all of the colors that I had in my stuff. Funny how something just comes together. Here is what I got! 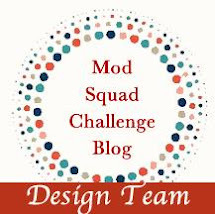 Short post today as I am having computer problems!!!!! 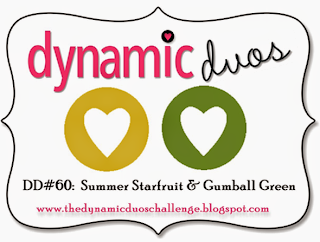 I created this card for the Dynamic Duos challenge #62 this week. 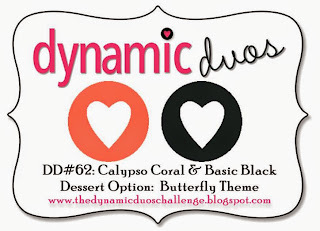 The colors are orange and black. I used the Gina K stamps that I got over the weekend, and I was anxious to craft as we were visiting family in Minneapolis. Four days away is too much. I am combining two challenges with week into one card. 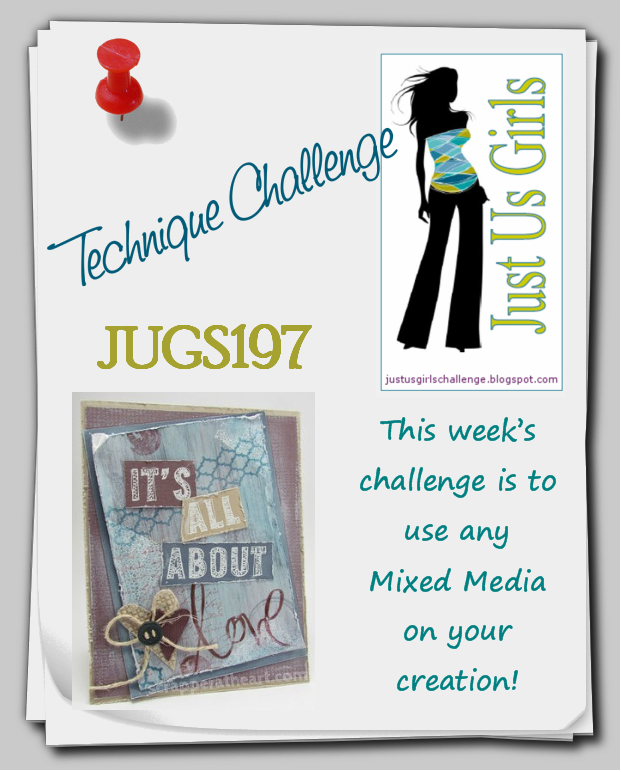 The first one is JUGS #197 with mixed media. Hmm... what is that? Well after watching the video, it looked like something I should try. I had all of the ingredient's, so I gave it a go. 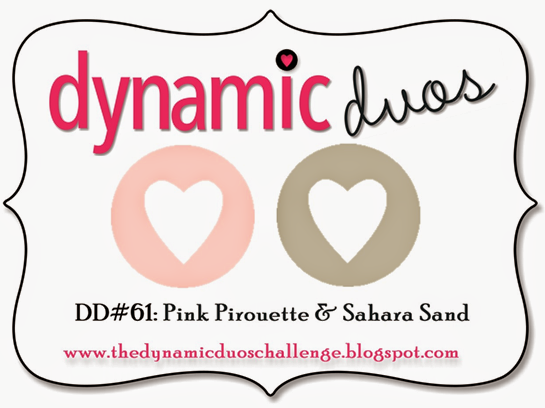 Dymanic Duos #61 soft and subtle color challenge this week is Pink and Sand, hence, the colors that I chose for this card. For this card I used a base colored with distressed ink Barn Door and Vintage Photo. Then, when the acrylic white paint mixed with water is applied, it comes out much lighter. I used two coats of white paint to get this effect. Then I used an embossing folder to apply versamark and white embossing power. It just shouted that it needed a rose, so I used this one from Gina K designs, Stately Flowers 6. I stamped on pink and colored with copics and then fussy cut. 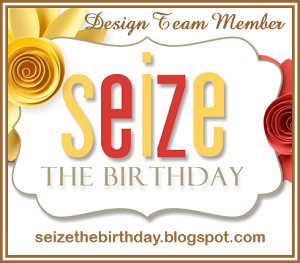 The sentiment is from the same set, and it is cut and embossed with a spellbinder die. 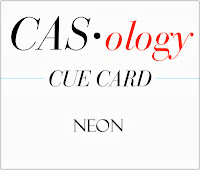 This week the challenge at CASology is Week 52 Neon. Boy that is a tough one! I had to go to the grandkids marker box to find neon markers, the only thing in my house that is neon. That was risky, as they are not really inkers, but here is my entry. I am pretty new at this stuff and wanted to try another challenge. CASology had a challenge entitled FRIEWORKS. I thought that was simple enough for my first attempt. So let's hope for the best. There are so many beautiful entry's. Today, I am going out of my comfort zone to enter new challenges. I have looked at many and decided that I just needed to give it a try. 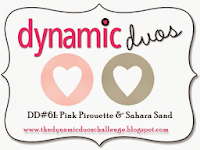 The first one is for Dynamic Duos. 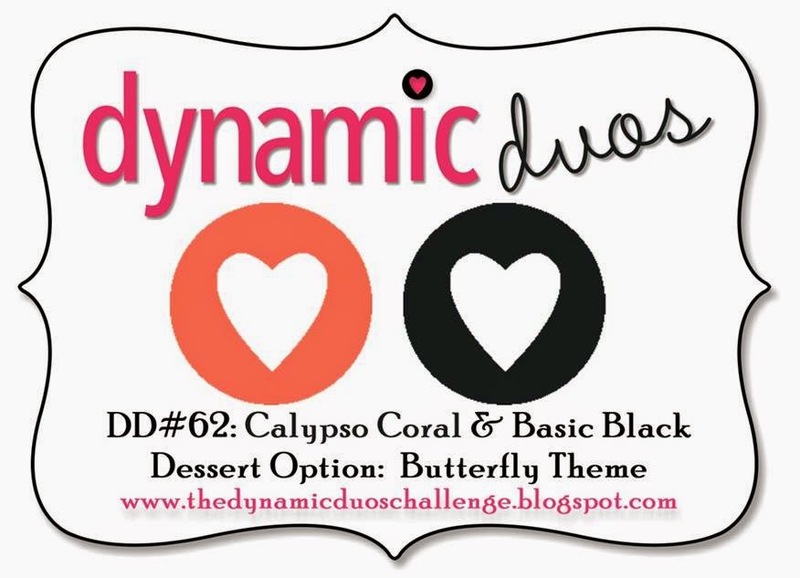 Their challenge is for two colors that remind be of my favorite football team, The Packers. Since I live in Wisconsin, and I own a share of this team, I thought of them, but football does not easily interpret into a card, so I did this one. 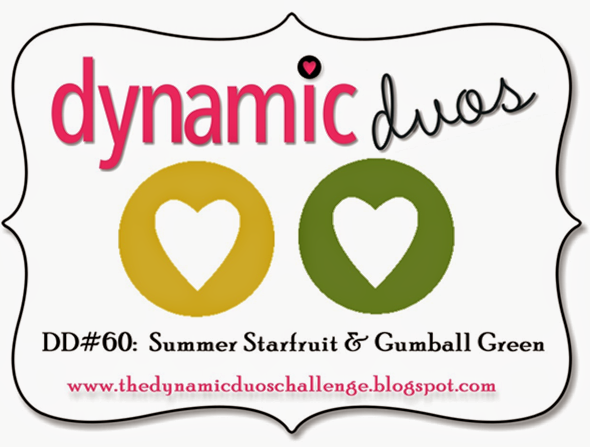 The two colors to be used are, Summer Starfruit and Gumball Green. Since I did not have those, I used So Saffron and Wild Wasabi. I Embossed the panel with a swiss dot folder and colored it with the So Saffron. Did the same with the green panel and layered both over black. Used my Big Shot to cut out some swirls and then heat embossed the flowers with clear and colored that back with the Wild Wasabi. Next time, I think that I would use black or white embossing powder. The next challenge is Just Us Girls. 196 This is the first time I have ever tried to do a sketch challenge. Here is the sketch. It has been a very busy summer so far. With the traveling and other obligations, I have not posted since May. So today, the grandkids had a sleepover and now we are crafting. We made water bottle treat holders for their soccer team. The team has 3 boys and 3 girls and the colors are navy and green. Here is how they turned out.